25/10/12 - Acquisition - Frankfurt, Städel Museum - The Städel Museum recently purchased a canvas by the Danish painter Vilhelm Hammershoi (ill. 1) from an English private collector, with the help of the Städelscher Museums-Verein. 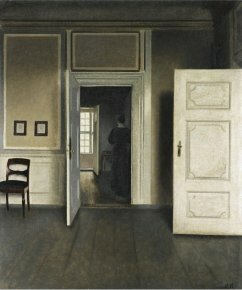 Somewhere between Realism and Symbolism, the artist is famous for his paintings of enigmatic and silent interiors, often empty, at times showing the presence of a woman seen from the back, with sideways lighting which reveals varying shades of grey and beige in a manner reminiscent of course of Vermeer. He mainly represented his apartment in Frankfurt, as is the case here, eliminating the use of details or narration. The interior presents a rigorous composition of perpendicular lines : the dark floor boards which draw the eye towards the back, the three white doors, the frames on the wall and the window panes. The open doors, the one on the right suggesting an invisible space and the two in the back which lead directly to the light of the window, reinforce the feeling of emptiness despite a discreet feminine presence concealed in the shadows, seemingly imprisoned in the space at the center of the painting. Hammershoi produced another version of this work in 1905 which now resides at the Athenum in Helsinki. He repeated the motif of the doors in several paintings such as the one at the Kunsthalle in Hamburg and the one at the Statens Museum for Kunst in Denmark which staged a show in 2012 on the ties between the Danish painter and European art. Hammershoi was also highlighted in France at the Musée d’Orsay with an exhibition in 1997. His art shares some points in common with Edward Hopper, currently on view at the Grand Palais in Paris.